Hello and welcome to this lesson on driving quality traffic to your site. At face value, this subject may seem slightly out of scope for a masterclass focused on encouraging users to act once they have arrived on your site. I certainly have no intention of turning this into a course on digital marketing. But, the type of traffic that you send to your website will have a significant impact on your site’s conversion rate. The problem is that digital marketing and the site itself are often thought of and managed as principally two independent activities, each with their specific metrics. Often digital marketing is measured by the amount of traffic it drives, while we judge a website on its ability to ‘convert’ that traffic. But in reality, the two are closely interlinked. Any digital marketing campaign will need to drive the right kind of people otherwise it will adversely impact the site’s ability to encourage them to act. It is therefore essential that we measure a digital marketing campaign on more than quantity, but the quality is given careful consideration too. The question then arises, how do you judge quality? Well, it is crucial not just to track the number of users who hit the website, but also what they do on the site. How many of the users from a campaign go on to take action? 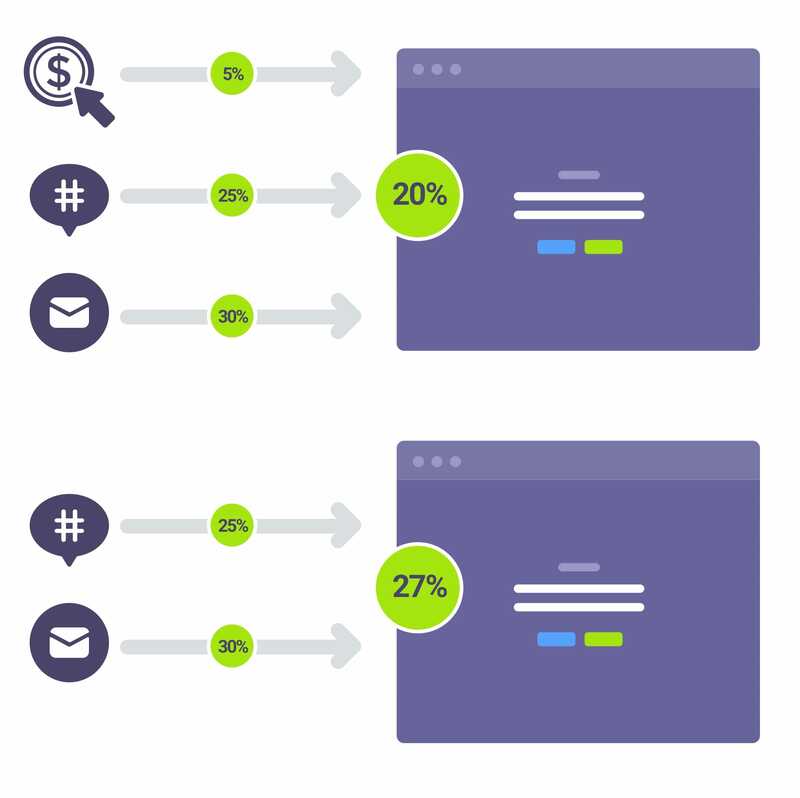 Tracking when a user clicks on an ad through to their decision to act on your site, enables you to measure which campaigns or channels are more effective, relative to one another. For example, is traffic from Twitter more likely to convert than those arriving from Instagram? Is that Facebook ad campaign you ran more likely to encourage action than the sponsored post you bought? Being able to answer these kinds of questions, not only allows you to focus your limited resources on the most successful channels, but it also lets you monitor the profitability of campaigns, if you know the value of a user acting on your website. However, most importantly within the context of this course, you can drop channels or campaigns that are dragging the overall conversion rate down. Imagine for a moment that you had three channels for driving traffic to your site; pay-per-click, social and email. The conversion rate on pay-per-click was running at 5%, while social was at 25% and email at 30%. That would make your site’s overall conversion rate 20%. However, if you dropped pay-per-click, the site’s conversion rate would increase to 27%. I am not suggesting that you will necessarily want to drop pay-per-click in that scenario, but it does demonstrate how an underperforming channel can depress your site’s overall conversion rate and how the site does not exist in isolation. Another alternative would be to optimise pay-per-click landing pages to help the channel perform better. But that wouldn’t help if the wrong kinds of people were clicking on the pay-per-click ads. So, how do we identify the right type of people? Let’s say you are selling web design services and decided to advertise via Google pay-per-click. You advertise on relevant keywords, but see an incredibly low conversion rate when people hit your site. Is that the site’s fault or could it be the campaign? Well, your site could be at fault, but the price could also be a significant issue. When people look for web design services, they have very different price expectations. A small business owner might only be looking to spend a few hundred, while a large corporation might be expecting to pay hundreds of thousands. If you don’t mention price in the ad, you could be attracting a lot of small business owners who are just not the right audience if your charges are targeting enterprise. It is beyond the scope of this course to discuss how to attract the right audience, but I am sure you can now see quite how critical it is to your conversion rate. But even the right audience may not act if they are not at the right point in the purchasing process. I once worked on a website for a company who sold project management software. Their marketing department decided it would be a good idea to ask users to register their details before they could view a demo of the product. They considered this an excellent lead generation tool, and sure enough, they saw a massive spike in the contact details they collected. But when the sales team followed up on these leads the conversion rate was abysmally low. That was because people were not ready to make a purchase. They wanted to view the demo so they could compare various options, but they were still a long way from buying. In my lesson on picking your moment, I talk about the same principle, for when to present a call to action to users on your site. But it also applies to your digital marketing efforts. If you drive people to your website at the wrong time in their purchasing journey, they will not act. When the time is right will depend on your website and where it sits in the sales funnel. Some sites guide users all the way through the purchasing process, while others cover only a part. That is why it is also essential to understand the customer's journey, as we cover in other lessons. Without understanding the journey, you cannot know where the website fits in or indeed when you need to reach out to people through digital marketing. But understanding the user’s journey is a topic for another lesson. For now, thanks for watching.